If you possess either or both of the Rare and Unusual volumes, you will not be disappointed by this one. This is a book that gets noticed - it weighs in at fourteen pounds. The vast majority five hundred and forty eight pages are in colour, and what colour! There are a couple of thousand flies illustrated here, many of them over life-size, and if you liked the lush style of the Rare and Unusual books, then you not be disappointed by this one. Words seldom fail me, but as a journey through the patterns of Ray Bergman, Charles de Feo, Preston Jennings, Mary Orvis Marbury and Carrie Stevens, Forgotten Flies never fails to impress. Each tier is introduced in the accompanying text, and then you are treated to page after page of their creations, shot in extreme close-up, many of the flies being originals. Not only is there a rare outing here for some of the marvellous collection of flies held at the American Museum of Fly Fishing, but there is also a superb chapter on Mary Orvis Marbury by John Betts. 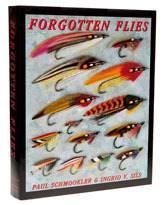 Even if you aren’t interested in fly fishing, this is a great book. I just about have to chain it up every time we have visitors. Out of print and appreciating very fast - this was the last book produced by The Complete Sportsman.